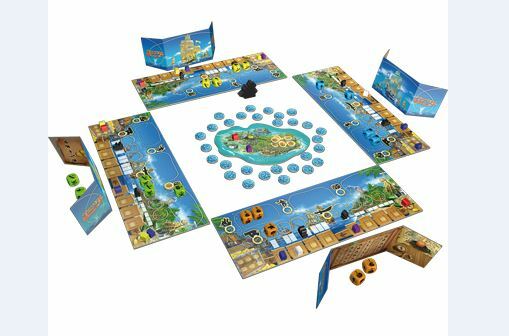 In Tortuga, players step into the role of daring pirates in search of the rare treasures of the Caribbean. Your goal is to get your treasure to the fabled pirate town of Tortuga. Once there, your looted treasures are safe and recognition from your peers is certain. But the road is long... and attacks from the other pirates for your coveted treasures are guaranteed. Only a large fleet, capable crew and many guns and sabers can keep your ship safe from competing pirates! Tortuga, as the box cover and title implies is a pirate themed game that uses a quasi yathzee styled dice mechanism for taking actions. Thje point of the game is to be the first to collect 6 treasures at the Island of Tortuga and hopefully, amass the greatest number of victory points in doing so. Players are given 5 unique dice that each possess graphics relevant to an aspect of managing a pirate crew and ship. These symbols include a ship (ship maintenance), a pirate (crew size), treasure chest (treasure hunting), cannon (boarding action), and a cutlas sword (pirate raiding action). Each die also contains a jolly roger symbol that is used as a wild (and can be used for assigning any symbol to the die). Above each symbol on the die is a number that denotes the strength of that action. Players simultaneously roll their 5 dice and get a single reroll action then assign their dice to the corresponding area on their tableaus. Once all rolling is completed, the action phase of the round pits the different pirates against each other based on the combined numeric strength of each die action to determine the first and second place players with the greatest totals. Each area of 5 areas of the tableaus is scored in turn and the end of the round sees players moving their treasures along a track of the bottom of their tableaus from the pirate island, crew area, cargo hold, and eventually to Tortuga. There are a few other items that occur within each round but the dice assignment represents the nuts and bolts of the player mechanic. As has been my experience with all Queen games that I have played, the component quality is very good. The dice are rounded wooden dice that are coloured to match the colour assigned to each player. The graphics on the dice appear to have been painted on, not embossed. However, they are decent enough. All the marking indicators and treasure chests are painted wood and are consitent in high quality. The other remaining pieces are the centre isle, tableaus, screens, and money tokens are nicely adorned and are of quality thick card. This game is visually appealing. Aside from the fact that Queen has proven that they have difficulty in sticking to projected timelines and customer service, the game did arrive and the component quality was high. Despite the component quality, the game is not very engaging, I like that players are pitted against each other at times but the fiddley nature of the game cancels much of the enjoyment that players can have. The 1st and 2nd position mechanic seemed to be at times disconnected form gameplay especially when used in the boarding/raiding actions. The scoring mechanism was not very intuitive and involved a low level complicated task in calculating the costs of different colour treasures and their combinations that left players scratching their heads at the end of the game. While I will play this game again, I’m reluctant to recommend it to other players. My intention is go go through this game and further streamline the rules so that they will be more accessible and intuitive for all players. While this game is alright, the gameplay certainly doesn’t match the eye candy that is presented. 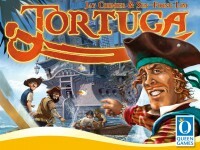 Add a Review for "Tortuga"